The town of Zola Predosa is located ten kilometres west of the city of Bologna near the aeroport. King James III and VIII was a guest at Palazzo Albergati in 1718. 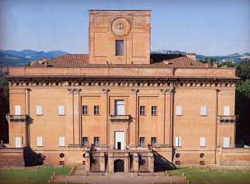 1 Today the palazzo is used as a conference centre. The palazzo is located at Via Masini, 46, about one kilometre north of the town centre of Zola Predosa (i.e. north side of the A1 autostrada). 1 Giampero Cuppini and Anna Maria Matteucci, Ville del Bolognese (Bologna: Zanichelli, 1967), 330. Image 1 (Facade): "Palazzo Albergati - Le Magnifiche Stanze", http://www.albergati.com/ita/stanze/default.htm.